Ever wonder about the chronology of events in Laura’s life and the historical context surrounding her experiences? The two timelines below weave some of her major life events with interesting historical milestones in literature, politics, science, and technology. Below is the interactive timeline, which allows you to view relevant photography and videos alongside historical events. 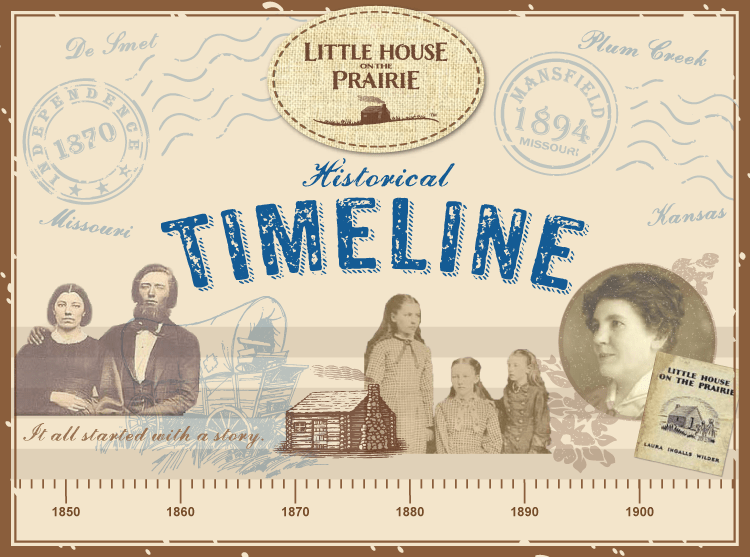 Below is the expandable timeline, which allows you to view groupings of important dates related to the life and legacy of Laura Ingalls Wilder. Click any heading to expand the dates in that grouping. 1/10/1836 – Charles Phillip Ingalls is born to Lansford Whiting Ingalls and Laura Louise Ingalls in Cuba, New York. 1838 – Samuel Morse invents Morse code which is still in use today. 12/12/1839 – Caroline Lake Quiner is born to Henry Newton Quiner and Charlotte Quiner in Brookfield Township, Wisconsin. 2/13/1857 – Almanzo James Wilder is born to James and Angeline Day Wilder on a farm near Malone, New York. 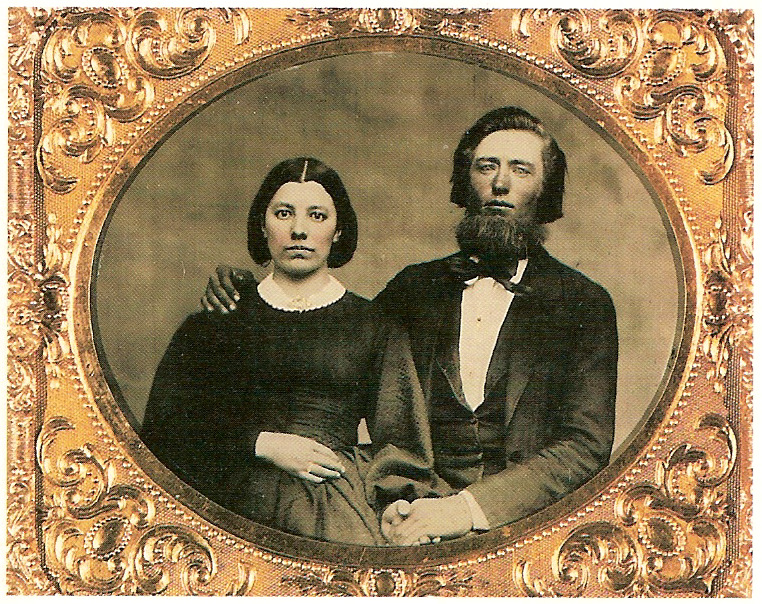 2/1/1860 – Charles Ingalls marries Caroline Quiner in Concord, Wisconsin. 4/12/1861 – Confederate forces bombard Fort Sumter in South Carolina, launching the American Civil War. 8/17/1862 – Four Santee Dakota men kill five settlers in Minnesota and trigger a six-week conflict that claims the lives of 400-600 white settlers and soldiers. As punishment, on December 26, 1863, 38 American Indian men are hanged, the largest public execution in American history. Laura refers to this conflict in Pioneer Girl. 1863 – English author Charles Kingsley publishes the classic children’s book, The Water Babies. 1863 – Charles and Caroline settle on a farm in Pepin County, Wisconsin. 1865 – English author Lewis Carroll publishes the children’s classic, Alice’s Adventures In Wonderland. 1/10/1865 – Mary Amelia Ingalls is born in the “Little House in the Big Woods” outside of Pepin, Wisconsin. 4/9/1865 – Confederate General Robert E. Lee surrenders to Union Lt. General Usysses S. Grant at Appomattox Court House, Virginia. 4/15/1865 – Actor and Confederate sympathizer John Wilkes Booth shoots President Abraham Lincoln at Ford’s Theatre in Washington, D.C., on April 14. The president dies early the next morning. 12/6/1865 – The Thirteenth Amendment to Constitution abolishing slavery in the United States is ratified. 2/7/1867 – Laura Elizabeth Ingalls is born in the “Little House in the Big Woods” outside of Pepin, Wisconsin. 1868 – Little Women, by Louisa May Alcott, is published in 1868. It is considered to be the first American young adult novel. 5/10/1869 – First U.S. Transcontinental Railroad is completed as the famous “Last Spike” is driven at Promontory Summit, Utah. 8/3/1870 – Caroline Celestia (“Carrie”) Ingalls is born in Montgomery County, Kansas. 1871 – The family leaves Indian Territory in the spring and returns to their home in the Big Woods. 1873 – The Ingalls family, along with hundreds of other farmers, loses its wheat crop year after year. This continued through 1877. 7/22/1874 – General George Armstrong Custer leads a military expedition into the Black Hills of Dakota Territory, a region that had been granted to the Sioux in 1868. Custer announces on August 15, 1874, that his expedition has discovered gold in the Black Hills. 1875 – English author George MacDonald publishes the classic, At The Back of the North Wind. 11/1/1875 – A baby boy, Charles Frederic Ingalls, is born. 1876 – Alexander Graham Bell is awarded a patent for the telephone. 6/25/1876 – General Custer and most of his Seventh Cavalry Regiment are annihilated by the combined forces of the Lakota, Northern Cheyenne, and Arapaho. The battle takes place in eastern Montana Territory but is prompted by the illegal settlement of the Black Hills. 7/7/1876 – The Ingalls Family sells the Plum Creek Farm and leaves Walnut Grove. 8/27/1876 – Baby Charles lives only nine months. He dies as the family moves east and is staying with relatives. 10/1/1876 – Charles and Caroline briefly manage the Masters Hotel in Burr Oak, Iowa. This business venture fails; Charles finds work in town. 1877 – Thomas Edison invents the first working phonograph. His cylinder phonograph was the first to reproduce sounds accurately. 1877 – English novelist Anna Sewell publishes Black Beauty. 5/23/1877 – Grace Pearl Ingalls is born in Burr Oak, Iowa. 1879 – Thomas Edison is granted a U.S. patent for the light bulb. The light bulb pictured in the Interactive Timeline is one used is a demonstration at Menlo Park in December of 1879. Winter 1879 – Mary suffers a stroke and loses her sight. In 2013, a medical team reviewed Mary’s case and determined her blindness was caused by viral meningoencephalitis. Spring 1879 – Almanzo, Royal, and Eliza Jane Wilder file adjoining claims on land near the planned townsite for De Smet. 9/9/1879 – Caroline and the girls arrive by train in Dakota Territory; Charles works for the Chicago and North Western Railway. The family spends the winter in the Surveyor’s House near Silver Lake. 2/19/1880 – Charles Ingalls files a homestead claim in Kingsbury County, near the De Smet townsite in Dakota Territory. 3/9/1880 – De Smet is named the county seat of Kingsbury County at a meeting in the Ingalls home (the Surveyor’s House) on March 9, 1880. Pa begins work on his first building in town in March. October 1880-May 1881 – An exceptionally long, hard winter shuts down the railroad, cutting off supplies of food and fuel to towns throughout Dakota Territory. The Ingalls family suffers from hunger and cold. 11/25/1881 – Mary leaves to attend the Iowa College of the Blind in Vinton, Iowa. 1883 – Scottish novelist Robert Louis Stevenson publishes Treasure Island. 12/10/1883 – Laura receives her first teacher’s certificate and begins teaching school in December 1883. 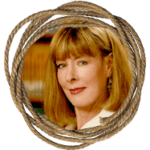 She begins teaching at the Bouchie school (called “the Brewster school” in These Happy Golden Years) and she boards with the Bouchies while Almanzo Wilder drives her home on weekends. 1884 – Mark Twain publishes The Adventures of Huckleberry Finn, a young adult novel. 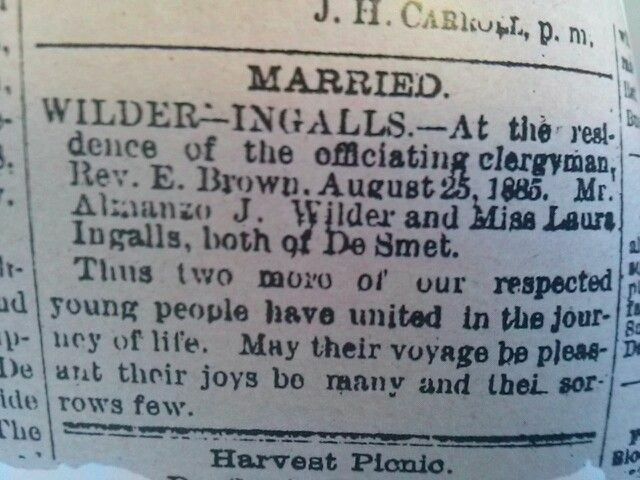 8/25/1885 – Laura and Almanzo are married in the home of the Rev. Edward Brown. 1886 – Karl Benz, eventual co-founder of Mercedes-Benz, invents the first gasoline-powered automobile. The internal combustion engine would go on to revolutionize travel. 12/5/1886 – Laura and Almanzo’s daughter Rose is born. She is named for the wild roses that thrive on the prairie. 3/5/1888 – Laura and Almanzo contract diphtheria; Grace Ingalls records the date in her diary. Almanzo suffers a subsequent stroke which permanently damages his legs. He limps through the rest of his life. 1889 – In June of 1889, Mary Ingalls graduates from the Iowa College for the Blind after attending classes there for seven years. 8/7/1889 – Laura and Almanzo’s baby boy dies. Grace Ingalls writes in her diary that “Laura’s little baby boy…looked just like Manly,” August 27, 1889. The baby was buried in the De Smet cemetery. 11/2/1889 – Dakota Territory officially becomes two states – North Dakota and South Dakota. 1890-1891 – Laura and Almanzo leave South Dakota and move to Spring Valley, Minnesota and then to Westville, Florida seeking recovery for Almanzo’s weakened health. 12/29/1890 – Soldiers from the Seventh Cavalry Regiment leave over 200 Lakota men, women, and children dead as tension over the Ghost Dance movement gives way to violence. Twenty-five soldiers die. August 1892 – Laura and Almanzo rent a house in De Smet, South Dakota and return in August of 1892. Laura works for a dressmaker in town; Almanzo takes on a variety of jobs. They begin saving money to buy a farm. 1893 – Josephine Cochrane unveils the first reliable (hand-powered) dishwasher was at the Chicago World’s Fair. 7/17/1894 – Laura, Almanzo, and Rose travel from South Dakota to Mansfield, Missouri, in a two-seated hack. Laura keeps a diary of the trip, later published as On the Way Home. They arrive in Mansfield on August 30, 1894. 9/21/1894 – Laura and Almanzo buy a 40-acre farm near Mansfield, Missouri; the sale included 400 seedling apple trees. Laura names the farm Rocky Ridge, and in the 1930s and early 1940s, writes the Little House books here. 1900 – Roberto Landell de Moura transmitted human voice wirelessly (by radio) for the first time. 1900 – American author L. Frank Baum publishes The Wonderful Wizard of Oz, the first book in an enormously popular series of Oz books. 6/8/1902 – Charles Ingalls dies at the age of 66, and is buried in the De Smet Cemetery. 1903 -American authors publish two enduring children’s classics: The Call of the Wild by Jack London and Rebecca of Sunnybrook Farm by Kate Douglas Wiggin. 1903 – At sixteen, Rose leaves Mansfield to finish high school in Crowley, Louisiana, home to her Aunt Eliza Jane Wilder Thayer. 12/17/1903 – Orville and Wilbur Wright invented the first gas motored and manned airplane. On December 17th they flew it for two short flights each, covering between 120-200 feet each time. 1905 – Albert Einstein publishes the Theory of Relativity. This theory becomes one of the two foundations of modern physics. 1908 – Engish author Kenneth Grahame publishes The Wind in the Willows. 1908 – Canadian author Lucy Maud Montgomery publishes Anne of Green Gables. 3/24/1909 – Rose marries Claire Gillette Lane in San Francisco, and eventually begins to write for the San Francisco Bulletin. 1911 – English author Frances Hodgson Burnett publishes The Secret Garden; Peter and Wendy, by Scottish author and playwright James Barrie, is published the same year. 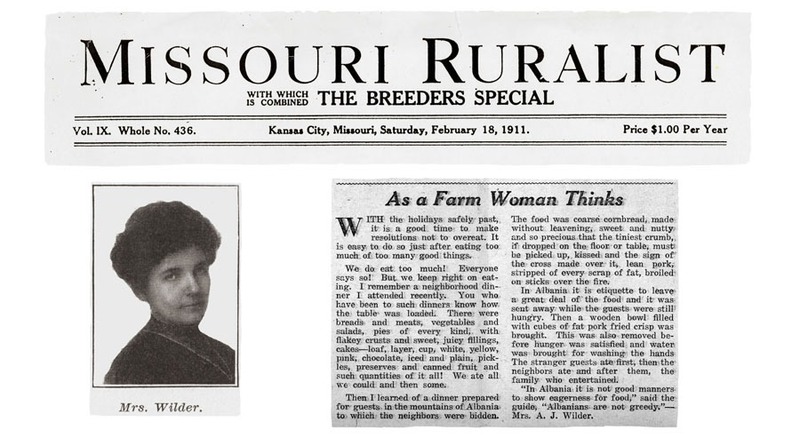 2/18/1911 – Laura launches her professional writing career as a columnist and later as the Home Editor for the Missouri Ruralist. She works for the newspaper through the mid-1920s. 1913 – Pollyanna by American author Eleanor H. Porter is published. 6/28/1914 – Archduke Franz Ferdinand of Austria and his wife Sophia are assassinated by a Serbian nationalist, sparking World War I in Europe. 1915 – While visiting Rose in San Francisco, Laura publishes her first work for children, a series of short poems in The San Francisco Bulletin. She uses the byline, “Laura Ingalls Wilder,” for the first time. 4/6/1917 – The United States declares war on Germany and enters World War I. 11/7/1917 – The Russian government is overthrown during the Russian Revolution. 1918 – Rose and Gillette are divorced, although they separated in 1915. 11/11/1918 – Germany signs the armistice at Compiègne, France, and suspends all fighting. The Treaty of Versailles formally ends World War I on June 28, 1919. June 1919 – Laura writes “Whom Will You Marry” for the June 1919 issue of McCall’s magazine. Rose edits the article. 1920 – The Story of Dr. Dolittle is published by British author Hugh Lofting. 5/4/1920 – Rose accepts a position with the Publicity Bureau of the American Red Cross, and travels extensively in Europe through 1921. 8/18/1920 – The Nineteenth Amendment to the United States Constitution, granting women the right to vote, is ratified. 1/10/1922 – Rose accepts a position with the Near East Relief Agency. She lives and works abroad for much of the 1920s. 4/20/1924 – Caroline Ingalls dies in De Smet, South Dakota, at the age of 84. She is buried in the De Smet Cemetery. 1925 – Adolf Hitler publishes the first volume of Mein Kampf, his autobiographical manifesto. The second volume is published in 1926. 1/17/1925 – Laura publishes “My Ozark Kitchen” in the January 17 issue of Country Gentleman. She publishes a second article, “The Farm Dining Room,” in the same magazine later that year. 1/26/1926 – John Logie Baird demonstrates the first mechanical television for the Royal Institution and a reporter for The Times. 1928 – Alexander Fleming discovers penicillin when one of the cultures in his lab developed an unexpected fungus. He observed that the colonies of bacteria around the fungus had been destroyed. February 1928 – Rose moves back to Rocky Ridge Farm in February 1928; her companion Helen Boylston (nicknamed Troub) joins her there in June 1928. 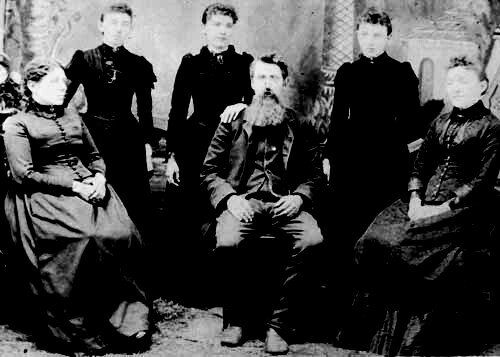 10/17/1928 – Mary Ingalls dies in De Smet, South Dakota, at the age of 63. She is buried at the De Smet Cemetery. 12/15/1928 – Laura and Almanzo move into the Rock House, a home Rose designed and built for their retirement. Rose and Troub live in the farmhouse at Rocky Ridge Farm. 10/29/1929 – The stock market crashes, signaling the beginning of the Great Depression. 1930 – American publisher Edward Stratemeyer creates Nancy Drew. She appears in her first book, The Secret of the Old Clock, written by Mildred Wirt Benson under the pseudonym of Carolyn Keene. 5/7/1930 – Laura finishes a handwritten, book-length autobiography Pioneer Girl. Rose edits subsequent versions, and attempts to market it later that year to New York publishers. 1932 – Laura revises a juvenile version of Pioneer Girl, which eventually becomes Little House in the Big Woods. The book is published when Laura is 65 years old. 1932 – Rose publishes Let The Hurricane Roar, a novel based on episodes from Laura’s Pioneer Girl. The book is retitled Young Pioneers in the 1970s. 1/30/1933 – Adolf Hitler Becomes Germany’s Chancellor. 1933 – Farmer Boy, Laura’s second novel is published, and is based on Almanzo’s childhood in Malone, NY. 3/4/1933 – Elected in 1932, Franklin D. Roosevelt becomes President and begins to implement his New Deal policies during the Great Depression. 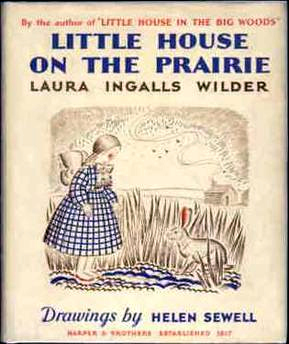 1935 – Little House on the Prairie is published. The fictional Ingalls family begins its trek across the American West in Little House on the Prairie, set on the Osage Diminished Reserve in Kansas. July 1935 – Rose moves to Columbia, Missouri, to research a new book. Laura and Almanzo move back into the Rocky Ridge farmhouse, where she writes the remaining Little House books. 1937 – On the Banks of Plum Creek is published. In On the Banks of Plum Creek, set in Minnesota, the Ingalls family lives in a dugout and endures a grasshopper plague. 1937 – Laura delivers a speech about her Little House novels at the Detroit Book Fair. The speech signals her emerging role as an important American children’s book author. 1937 – British author J.R.R. Tolkien publishes The Hobbit. 4/1/1938 – Rose buys a farmhouse in Danbury, Connecticut. 1938 – On the Banks of Plum Creek is named a Newbery Honor Book by the American Library Association. 1938 – Rose publishes Free Land, her second novel based on material from Laura’s Pioneer Girl. 1939 – By the Shores of Silver Lake unfolds in Dakota Territory, where the Ingalls family finally settles. 9/1/1939 – Germany invades Poland, and within days, France, Great Britain, and Canada declare war on Germany. 1940 – The Long Winter is published. By the Shores of Silver Lake is named a Newbery Honor Book by the American Library Association. 1940 – American author Maud Hart Lovelace launches her semi-autobiographical historical fiction series with Betsy-Tacy, set in Minnesota in the late 19th and early 20th centuries. 9/27/1940 – Germany, Italy, and Japan sign the Tripartite Pact, creating the Axis Powers of World War II. 1941 – Little Town on the Prairie is published. The Long Winter is named an ALA Newbery Honor Book. 11/10/1941 – Grace Ingalls Dow dies in Manchester, South Dakota, at the age of 64, and is buried in De Smet. 12/7/1941 – Japan bombs Pearl Harbor, and the United States declares war on Japan the following day. A few days later, Germany and Italy declare war on the United States. 1942 – Laura’s work receives more literary recognition! By the Shores of Silver Lake is awarded Pacific Northwest Library Young Reader’s Choice Award. Little Town on the Prairie is named a Newbery Honor Book by the American Library Association. 1943 – These Happy Golden Years, the final book in Laura’s Little House series, is published. It is named a Newbery Honor book in 1944 by the American Library Association. 1943 – Rose Wilder Lane publishes Discovery of Freedom: Man’s Struggle Against Authority. 1943 – American author Esther Forbes publishes Johnny Tremain. 6/6/1944 – D-Day, the Allies’ massive invasion of France, is successful, but 2,500 Americans lose their lives. 4/12/1945 – President Roosevelt dies in office, and Harry S. Truman becomes President of the United States. 5/7/1945 – Germany surrenders and V-E Day (Victory in Europe) is celebrated two days later. 8/6/1945 – The United States drops an atomic bomb on Hiroshima; three days later, it drops a second atomic bomb on Nagasaki. 8/14/1945 – World War II ends when Japan Surrenders; the ceremonial end to the war occurs on the U.S.S. Missouri on September 2, 1945. 6/2/1946 – Carrie Ingalls Swanzey dies in Rapid City, South Dakota, at the age of 75, and is buried in De Smet. 1947 – Raytheon builds the “Radarange”, the first commercially available microwave oven. It was almost six feet (1.8 meters) tall and weighed 750 lbs. (340 kilograms). 10/23/1949 – Almanzo Wilder dies in Mansfield, Missouri, at the age of 92. He is buried in the cemetery at Mansfield, Missouri. 6/25/1950 – North Korea Invades South Korea; the U.S. sends in troops to support South Korea two days later. 1950 – British author C.S. Lewis publishes The Lion, the Witch, and the Wardrobe, the first book in his classic fantasy series for children. 1951 – J.D. Salinger’s novel, Catcher in the Rye, is published for adult readers; now it is considered a classic young adult title. 7/27/1953 – North and South Korea suspend combat and create a demilitarized zone between the two countries. 10/1/1953 – The Little House books are reissued with new illustrations by Garth Williams. 1954 – The American Library Association creates the Laura Ingalls Wilder Award; Laura Ingalls Wilder is presented with the first award. The award honors an American author or illustrator who has made lasting and significant contributions to children’s literature. 2/10/1957 – Laura Ingalls Wilder dies at home at the age of 90. She is buried in the cemetery at Mansfield, Missouri. 1960 – American author Harper Lee publishes To Kill A Mockingbird for adult readers. It has since become a young adult classic. 4/12/1961 – Yuri Alekseyevich Gagarin is the first human to journey into outer space, when his Vostok spacecraft completed an orbit of the Earth. 1962 – On the Way Home by Laura Ingalls Wilder is published. 1962 – American author Madeleine L’Engle publishes A Wrinkle in Time, the first novel in her series for children about the Murry and O’Keefe families. 11/22/1963 – President John F. Kennedy is assassinated in Dallas, Texas. Lyndon B. Johnson is sworn in as President of the United States. 1964 – Harriet the Spy, written and illustrated by Louise Fitzhugh, is published. 8/2/1964 – The North Vietnamese allegedly fire on the U.S.S. Maddox in the Gulf of Tonkin. Congress authorizes President Johnson to escalate military operations in Vietnam. 1965 – American forces conduct bombing raids over North Vietnam. The war escalates dramatically throughout the decade and into the early 1970s. July 1965 – Rose accepts an assignment with Woman’s Day magazine and flies to the Republic of Vietnam in July to report her observations about the country and its people. December 1965 – “August in Vietnam” appears in the December issue of Woman’s Day magazine. 1967 – American author S.E. Hinton publishes a groundbreaking young adult novel. 10/30/1968 – Rose Wilder Lane dies at the age of 81, and is buried beside her parents in the cemetery at Mansfield, Missouri. 1969 – Ground-breaking American author Judy Blume publishes her first novel for young readers, The One in the Middle is the Green Kangaroo. 7/20/1969 – The Apollo 11 mission marks the first time humans set foot upon another world as Americans Neil Armstrong and Buzz Aldrin land on the Moon. 1971 – The First Four Years by Laura Ingalls Wilder is published posthumously. The book deals with newlyweds Laura and Almanzo struggling against the harsh realities of frontier life. 1/28/1973 – The United States signs a cease-fire agreement, and the last American troops leave Vietnam in 1973. 1974 – West from Home: Letters of Laura Ingalls Wilder, San Francisco, 1915 is published. 3/30/1974 – “Little House on the Prairie”, the television pilot, introduces the Ingalls family to millions of viewers around the world. 9/11/1974 – “Little House on the Prairie,” the television series, airs on NBC on Wednesday nights at 8:00pm. In 1976, NBC moves the series to Monday nights and it remains ranked in the Top 30 for the rest of its nine-season run. 1989 – The World Wide Web is invented by Tim Berners-Lee. 1995 – The Golden Compass, the first novel in Philip Pullman’s His Dark Materials series is published in the United States. This British novel appeals to both young adult and adult readers, establishing a cross-over readership trend in Young Adult fantasy. 1997 – J.K. Rowling’s popular British fantasy series is launched in the United States with Harry Potter and the Sorcerer’s Stone. The best-selling series raises new interest in fiction for young readers. 2005 – Twilight, the first novel in a vampire series for young adults, is published by American author Stephanie Meyer. The series builds on the renewed interest in Young Adult fiction generated by the Harry Potter series. 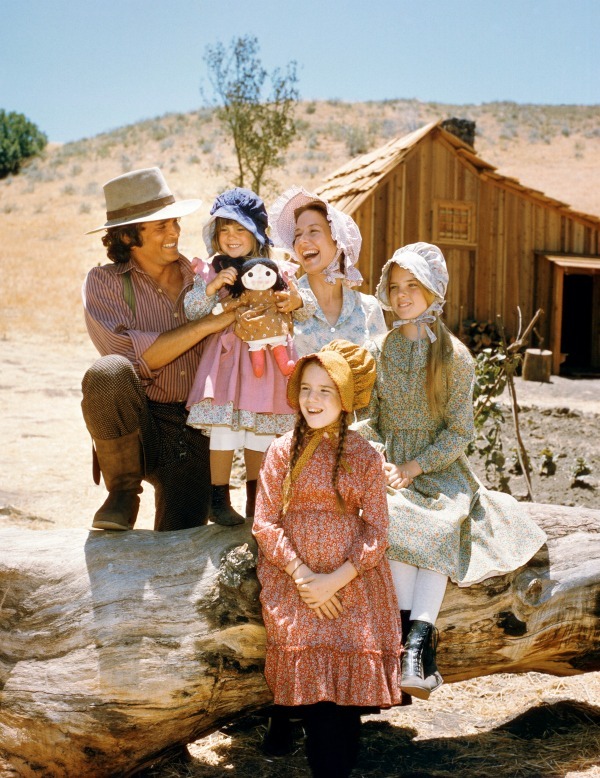 3/26/2005 – “Little House on the Prairie”, the mini-series is broadcast on ABC on successive Saturday evenings beginning on March 26, 2005 in The Wonderful World of Disney time slot. 2007 – Apple introduces the iPhone, one of the first mobile phones to use a multi-touch interface. 2008 – American author Suzanne Collins publishes the first novel in her best-selling series, The Hunger Games. The books are part of a trend in YA literature focusing on dystopian settings. 8/15/2008 – “Little House on the Prairie, The Musical” is a stage adaptation of Laura Ingalls Wilder’s stories, which breaks box office records at the Guthrie Theater in Minneapolis. October 2009 – “Little House on the Prairie, The Musical” tours 28 cities in the U.S. and Canada from October 2009 through June 2010. 11/17/2014 – Pioneer Girl: The Annotated Autobiography is published. Laura’s autobiography is published for the first time- over eighty years after she wrote the original draft. February, 2015 – “Little House on the Prairie: The Legacy of Laura Ingalls Wilder” is a one-hour documentary directed and narrated by Dean Butler who played Almanzo Wilder on the original television series. Get more facts and trivia about Little House on the Prairie by making sure you are subscribed to our monthly newsletter. I love little house on the prairie television series and all the books.I never get enough of the shows. I have all nine seasons.I also have on DVD beyond the prairie.someday I want to visit the laura ingalls wilder museum. LHOP is a wonderful program full of lessons we can learn from. They were very special people. Some day I want to visit the various places they have lived at. Ring in that time and Era been extremely difficult full of love and surprises. I read the books when I was a little girl. Never missed a show when they first came out and now I am in my seventies I still watch the reruns over and over. I always thought I should have been born in the pioneer days. Simply loved this family and their story. I absolutely love Little House on the Prairie. Amazing stories and though they had their great challenges too, so much more peaceful than these modern times full of vulgarity, violence and hate. I wish someone would do another series similar to Little House on the Prairie or The Waltons with great actors and beloved stories. There’s great hunger for this type of wholesome entertainment. I watch LHOTP for HOURS sometimes. I agree with Haydee as we need more shows like LHOTP and the Waltons. Would someone please produce good, wholesome shows that I can enjoy with my grandchildren. Stories like LHOTP that show how people lived, loved and worked for what they had. I love LJOTP. Watching it right now. Then Bonanza, That Walton’s also. Wonderful shows.